I had a post ready to go tonight about mulching strawberry plants with re-purposed slate shingles. It’s a great idea but it’s going to have to wait because I just came across pictures of my father’s dog, Ching. 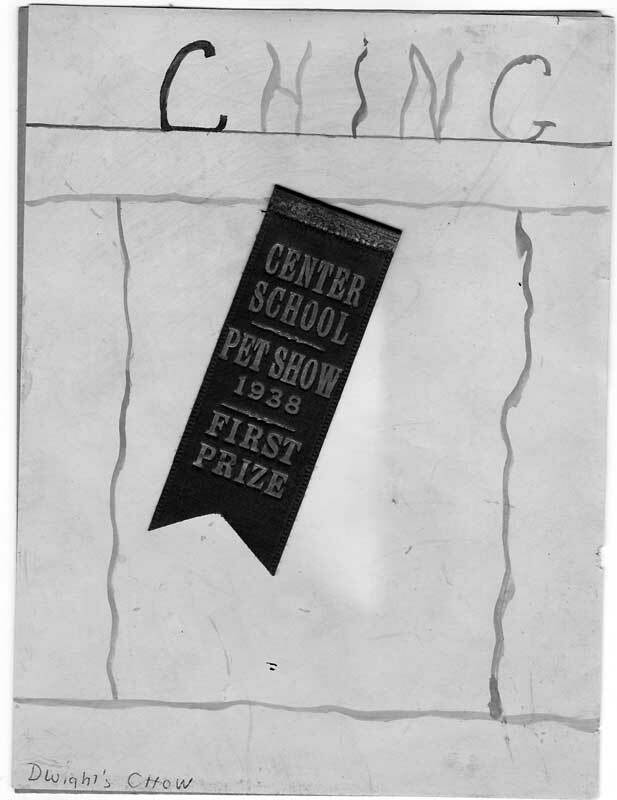 Ching won a blue ribbon at the pet show in 1938. My father would have been 12 years old. 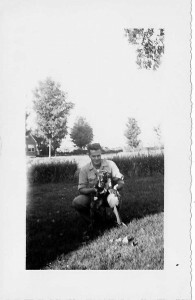 I don’t think I could have picked the breed but on the bottom left of this piece of newsprint there’s a note, “Dwight’s Chow”, in my mother’s printing. There are also photos of Ching on the hood of my father’s car (probably four years later, when Dwight could drive? ), and another of him with his bowl of kibble. Could the car geeks help me out here? My grandfather ran Burnham’s Garage in Bloomfield, CT. for many years, and all the boys had cars. Click on the photo to enlarge and tell me, is that a Buick? Very classy, especially with the canine hood ornament. That’s a happy dog. Kind of a weird photo, but a happy dog. A boy and his dog, with apologies to Harlan Ellison. This entry was posted in family, gone but not forgotten and tagged family, hardy ancestors, rememberance on November 18, 2011 by APo. Wow, thanks Keith! Excellent to have pictures.